Stanley Reginald Gough was born in Yeovil in 1898, the son of Frederick George Gough, known as George, (b1869) and Alice née Gard (1868-1950). The family lived in the Cross Keys Inn at 111 Park Street where George was landlord as well as being a leather parer during the day. George and Alice had eight children; Elsie Alice (1868-1950), Ethel May (1894-1980), Wreford George (1896-1971), Stanley Reginald, Percy (b1902), Eva (b1903), Doris (b1904) and Olive (b1907). In the 1901 census the family were living at the Cross Keys Inn but had moved by 1903. They were listed in the 1911 census boarding at 73 Park Street. It is not known when Stanley enlisted but, assuming he didn't enlist while under-aged, he most likely enlisted in 1917. Enlisting in Yeovil, he initially served in the 1st Hampshire Regiment as a Private (Service Number 42059) but was transferred to the 10th (Service) Battalion of the Worcestershire Regiment, where his Service Number was 57453. The 10th (Service) Battalion, Worcestershire Regiment, had been in France as part of the 57th Brigade in the 19th (Western) Division since July 1915 for service on the Western Front. It is likely that Stanley was serving with this regiment by September 1917. During the last quarter of 1917 the 10th (Service) Battalion, most likely including Stanley for much of the fighting, saw an enormous amount of action. The Battalion took part in the Battle of the Menin Road Ridge (20 to 25 September 1917), the Battle of Polygon Wood (26 September to 3 October 1917), the Battle of Broodseinde (4 October 1917), the First Battle of Passchendaele - part of the Third Battle of Ypres (12 October 1917) and the Second Battle of Passchendaele - the culminating attack of the Third Battle of Ypres (26 October to 10 November 1917). In June 1918 the battalion did not take part in any set battles on the Western Front but on 18 June 1918 Private Stanley Gough was killed in action in the day-to-day fighting on the Western Front. He was aged just 19. By 22 June 1918 the 10th (Service) Battalion, with so many casualties, was reduced to a training cadre and most remaining personnel transferred to the 3rd Battalion of the same Brigade and Division. On 28 June 1918 the remaining cadre transferred to the 121st Brigade of the 40th Division and on 10 November 1918 it was absorbed by the 17th Battalion. 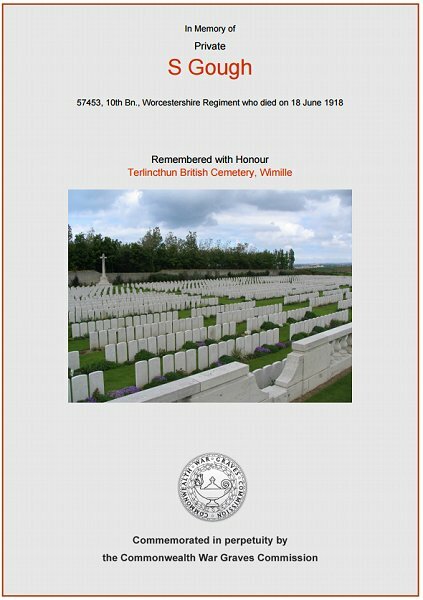 Stanley was buried in Terlincthun British Cemetery, Wimille, Pas de Calais, France, Grave XVI.B.13. His name is on the War Memorial in the Borough and is inscribed in the County of Somerset Book of Remembrance in St Martin’s Chapel, Wells Cathedral. The Commonwealth War Graves Commission certificate in memory of Stanley Gough. 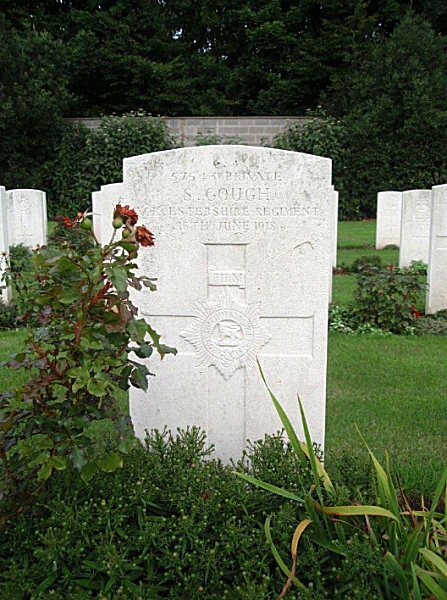 Stanley Gough's headstone at Terlincthun British Cemetery, Wimille, Pas de Calais, France.